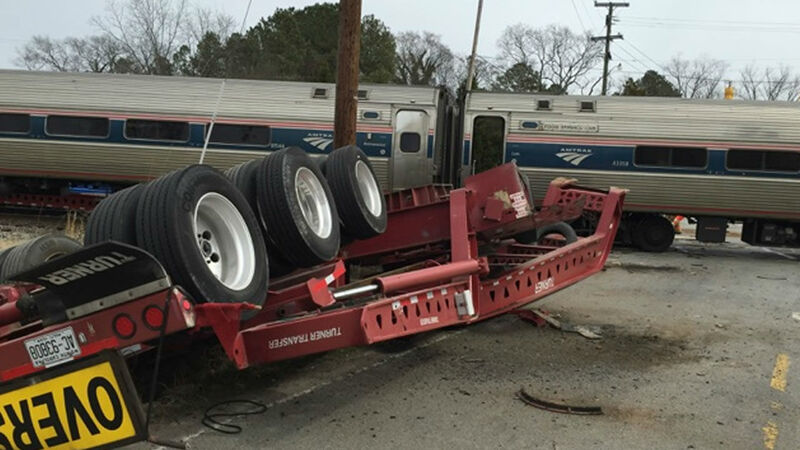 HALIFAX, NC -- An Amtrak train collided with a tractor-trailer truck on the tracks at N.C. Highway 903 and U.S. Highway 301 in Halifax Monday leaving 55 passengers injured. The incident happened around 12:15 p.m. Monday. Pictures from Chopper 11 HD showed the train's engine on its side and the luggage car off at an angle to the tracks. 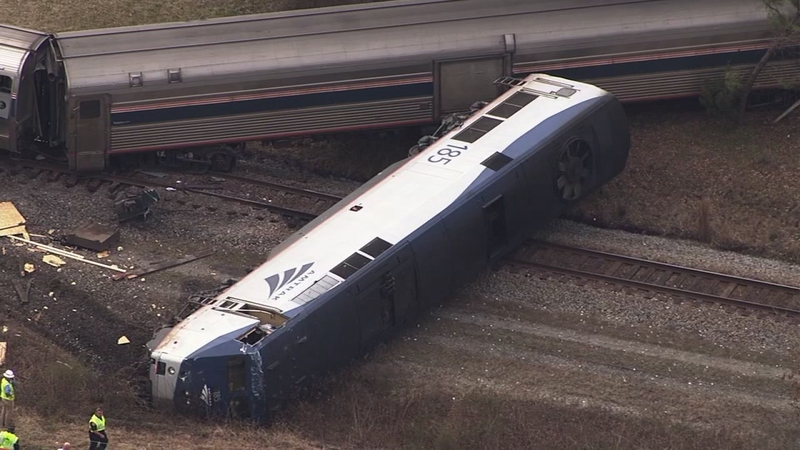 A passenger car behind the luggage car also derailed, but remained upright. The injured were taken to Halifax Memorial Hospital and Nash General Hospital where most were in good to stable condition. One patient was flown to Vidant Medical Center in Greenville in serious condition. "We are relieved that there are no fatalities reported at this time, and our thoughts and prayers are with those who were injured," said N.C. Transportation Secretary Tony Tata. Amtrak officials said there were 213 passengers and eight crew members on the train. The cab of the truck was intact, but the low-boy trailer carrying a large electrical unit covered in a large blue tarp was obliterated by the force of the impact. The extra-long truck had a special permit to operate and was being escorted by the Highway Patrol as required. 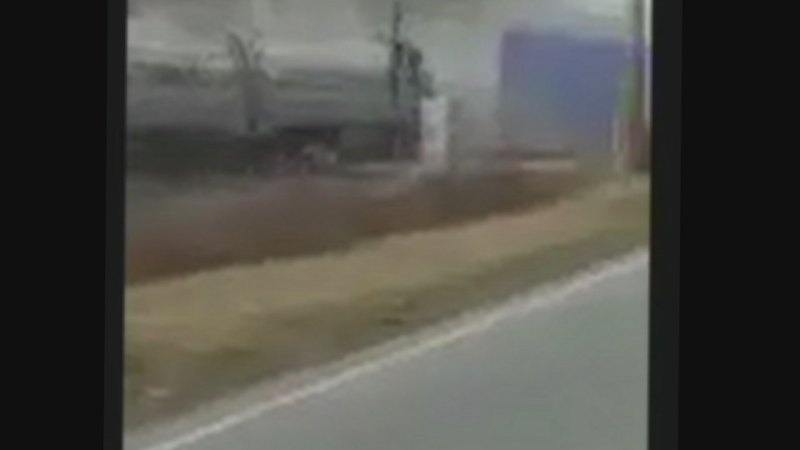 The driver of the tractor trailer, John Devin Black, of Claremont, N.C. was not injured. The conductor of the Amtrak train has been identified as Keenan Talley, of Raleigh. A woman who witnessed the crash said the driver was lingering on the tracks because he was trying to make a difficult turn on the other side of the tracks. Leslie Cipriani, of Roanoke Rapids, said the tractor-trailer backed up several times as the driver tried to make a left turn. A few minutes later, said she heard the sound of the oncoming train and saw the cross bars hit the tractor-trailer. The driver then jumped out of the truck. Cipriani shot video of the impact with her phone. "It looked like something exploded. I mean, the structure... and the engine of the train went airborne," said another witness, Jamie Carter. "They both went high enough they were above the tree line. It rattled the ground and when it came to rest. It's a miracle. God had his hands on this entire scene today." The train - the #80 Carolinian - was headed north from Raleigh with an eventual destination of New York with stops in major cities like Philadelphia. The unhurt passengers were taken by bus to Richmond to continue their journey. Anyone looking for information about friends and family on the train can call a special hotline at 1-800-523-9101. Federal and state investigators are continuing their investigation. No criminal charges will be filed. 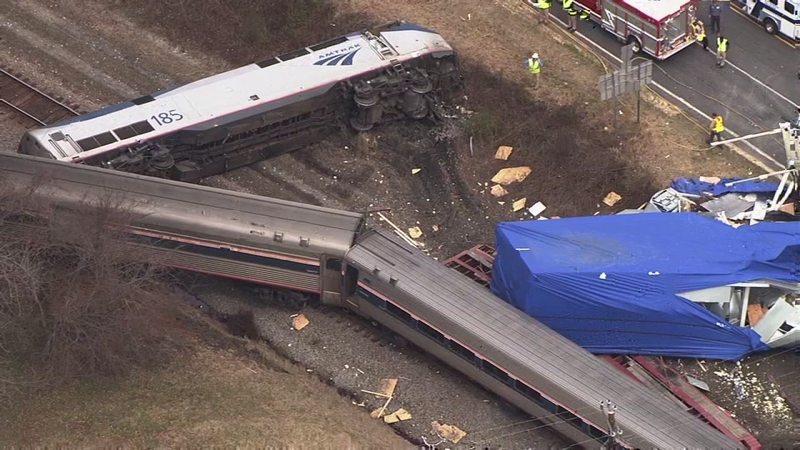 An Amtrak train collided with a tractor-trailer truck on the tracks at NC-903 and US-301 in Halifax Monday. The ABC11 I-Team did some digging to find out how often train accidents are happening at railroad crossings in North Carolina. Between 2005 and 2014, federal investigators reported 585 accidents, which is a little more than one collision per week. They peaked at an annual total of 77 wrecks in 2008. Since then, there's been a slight decline but they have been averaging 50 a year since 2009. The Federal Railroad Administration said there have been 303 injuries and 57 people killed at railroad crossings in the past ten years.